In need of date night inspiration? 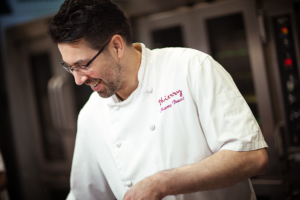 Rekindle the love while creating Chef Thierry’s decadent Dark Chocolate Truffles. They’re the closest we’ve found to a love potion. Who could resist? Bring the cream to a boil and pour over the chocolate. Gently whisk from the center until chocolate is melted and the ganache is smooth and glossy. Stir in the butter and let it rest at room temperature until thickened. Using a teaspoon, portion out small dollops of ganache onto parchment paper. Let this set in the fridge for approximately half an hour. Take the ganache out of the fridge and roll each portion between your hands to create small balls then let these set in the fridge for another half an hour. During this time, melt the dark chocolate over a double boiler. 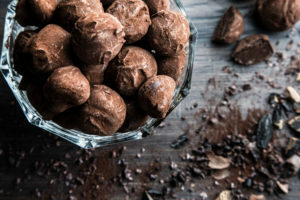 If possible, use a thermometer to check that the temperature is as close as possible to 32 C. Remove the ganache balls from the fridge, dip in the melted chocolate and roll in cocoa powder. 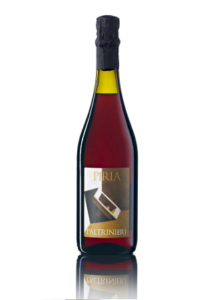 For the perfect pairing, Elisa’s Wine Director, Franco Michienzi recommends Paltrinieri ‘Piria’ Lambrusco Di Sorbara Frizzante! Cheers!